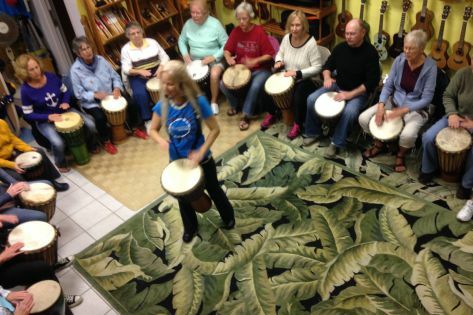 Barbara Gail teaching a Djembe Class. Learn to play the most popular hand-drum! Barbara Gail is a teacher’s teacher, & has been instructing djembe students ages pre-teens to eighty-somethings, since 1996. With a focus on hand technique & teaching rhythm patterns sequentially, she masterfully helps you find your place in the beat & play as a multi-rhythmic ensemble. Perfect for raw beginners, drum circle enthusiasts, & folks with some exposure to drumming who seek rhythmic music instruction with a solid foundation. Welcome adults, motivated teens, & youth ages 10 & up with instructor permission. No musical experience needed, a positive experience for all! A minimum of 12 people are necessary in order to fly! Meet Barbara: Barbara Gail is co-owner of The Rhythm Inlet & The Ukulele Place. An alchemist in the arts of rhythm & movement, she’s been affectionately referred to as a Rhythm Ambassador & Pied Piper of Rhythm, spreading the joys of drum & dance to people of all ages, abilities & challenges. Since 1993 she’s had a blast enthusiastically leading thousands of people — ages 1 to 85 — in her dynamic programs & profound group experiences, bringing her to well-over 400 schools, libraries, camps, conferences, agencies, staff retreats, studios, festivals, temples, churches, women’s groups, ALF’s, special populations, private engagements, community events… You name it, yeah, she’s probably done that, too. Her varied & in-depth explorations have given her a comprehensive & ever-evolving understanding of the role of rhythm in our lives individually & collectively, & in ceremony & celebration. Cost is $125 & includes 8-Week Class Series, plus extra event night March 6, & play-along 2-CD set. Already a Monthly Member of Jeff’s uke classes? Then all you’d owe is $25! Bring $3 each week for your in-class drum rental, or BYO appropriate & tuned drum. *NOTE! Wanna check it out first, to see if this class right for you? Register & pay $20 in advance or $25 the day of, for the first day, which goes toward your total tuition price, which remains the same. Your balance is due before you leave after class. Please call (941) 966-5800 anytime to register, or for more information.